November is National Life Writing Month as well as Family Stories Month. I have been excited about discovering a woman after my own heart—Marlys Styne, contributor to eGenerations and The Elders Tribune as well as an author and fellow blogwriter. I love her two blogs, Never Too Late! and especially Write Your Life, which are related to mine in that we both encourage people to tell their stories. 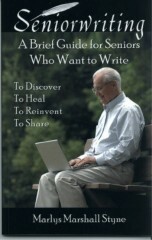 Marlys has a recently published book, “Seniorwriting: A Brief Guide for Seniors Who Want to Write.” It is an introduction to life writing that offers writing tips, prompts, and samples for those who are without much writing experience and who just want to keep things simple. Legacy journals are commonly given to grandparents whose families want to unlock the treasure chest to delight in the pearls, but those journals are filled with so many questions that they may be daunting (Is this homework? Must I answer ALL these?! ), and one of the biggest complaints is there not being enough space to write. On the other hand, just sitting down to write one’s stories can feel overwhelming without at least some kind of guidance or structure. That’s where Seniorwriting steps in. Seniorwriting would be of help to those who don’t want to be overwhelmed with writing theory and who intend to write only for family. It would also be a good tool for family members to use to encourage older relatives to write, or perhaps even use to pry the stories out and write them down for their relatives as I had to do with my mom. I am going to give my copy of this book to my dad, and hope to work more with him so that our family will have his book of stories, too. For those who are interested in working to produce a more serious memoir, consider “Writing Your Life: An Easy-to-Follow Guide to Writing an Autobiography” by Mary Borg. You never know… Seniorwriting just might bring out the writer in you or your family member. This entry was posted in lifewriting, memoir writing. Bookmark the permalink. Thanks for the fine review, Linda. Also, thanks for telling me about National Life Writing Month and Family Story Month. I was glad to be reminded that life writing is not just for seniors; younger people, including students, can participate too! I’m glad this lasts for a full month. I just tuned in, half a month late.